Welcome to the Uxbridge Music Hall Official website. The Uxbridge Music Hall is located right in the heart of the town of Uxbridge and hosts many productions and events such as: Abbamania, musicals, live dramas, stand-up comedy, concerts and dance recitals. 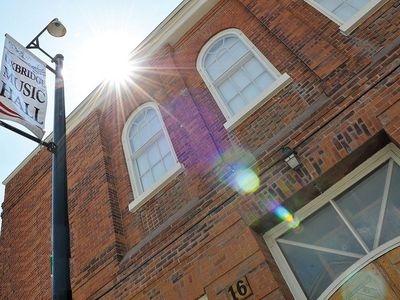 Known for its superior acoustics, the Uxbridge Music Hall is a thriving cultural centre. Widely used by theatrical groups such as: OnStage Uxbridge, uxperience, Ryleepuss Productions, Uxbridge Youth Theatre, VIP Productions, Uxbridge Dance Academy and music groups such as the Pineridge Chorus, the Uxbridge Music Hall is an outstanding specimen of the local heritage. The interior of the hall has been restored and the original opera chairs are still in the balcony encircled by the beautiful carved iron railing. In the centre of the building is the original cut glass chandelier with a diameter of approximately three feet. This beautiful historical facility is air conditioned, making it an ideal facility for spring/summer.